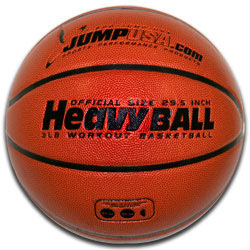 The Heavy Ball Basketball is official size but at 3 lbs, it weighs more than twice the official weight (which is 1.3 lb.) Practicing with a heavier ball will improve all areas of your game by helping you become a stronger shooter, passer, rebounder, and ballhandler. Available in both regulation and Intermediate sizes. 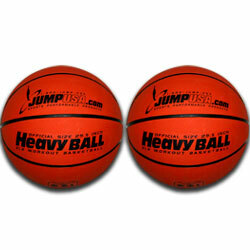 Excellent grip and feel, bounces like a regulation basketball. For complete ball handling control, there is no such thing as lefthandedness or righthandedness. You need to be equally adept with either hand. This two ball package lets you do double ball drills that maximize your ball handling skills simultaneously for either hand. Regular size 29.5" 3 lbs., Intermediate size 28.5", 2.75 lbs. Rubber construction.